RIVERSIDE (California) - The revolution, having recently broken out in New York, has now begun to spread to other cities. 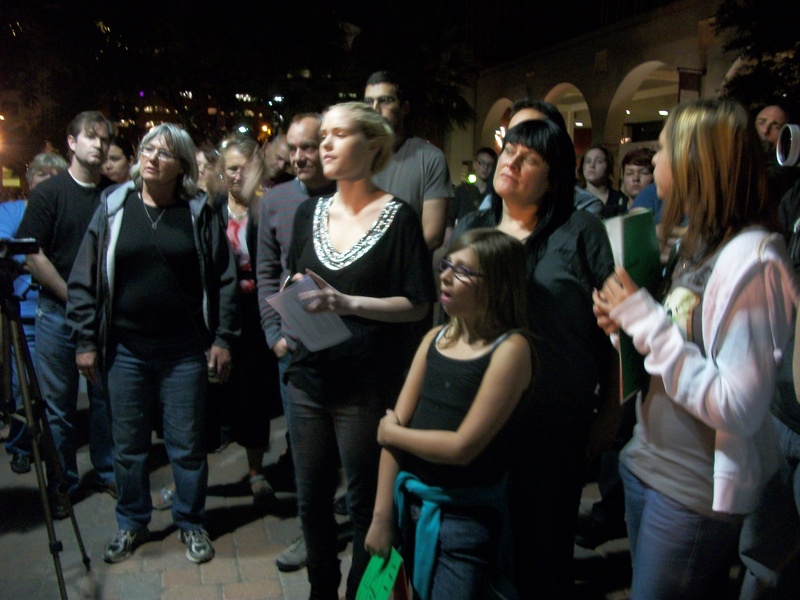 Inspired by our newly-free sisters and brothers in nearby Los Angeles, who recently liberated areas surrounding corruption-filled City Hall, citizens of Riverside met tonight for a general assembly to plan to emancipate areas of their city through occupation and take further action against the 1% of humanity that perpetrates inequality and disgrace. Just after 7:PM, no fewer than 50 concerned citizens, eager to do their part to oppose tyranny, gathered in the shadow of the statue of Mahatma Gandhi to discuss the terms of their liberation. 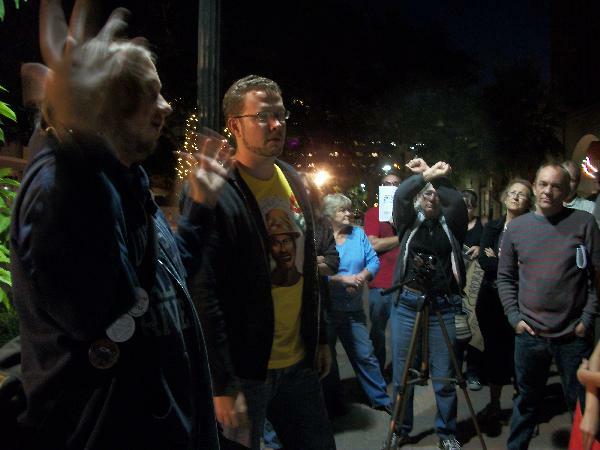 According to a show of hands, about 5-10 of us had been at the Los Angeles occupation. After reading the principles of solidarity and composing an agenda, the people reviewed meeting procedures, including the use of the people's mic and hand gestures. Then suggestions for committees were taken. The people deliberated these suggestions, folding some groups into others and eventually settling on committees for action, logistics, outreach, security, finance, media, legal, arts, education, and facilitation. We then began introducing proposals for areas to liberate. One man suggested the steps of the courthouse, where, every friday, banks auction off homes stolen from families to the highest bidder. The significance of the location was acknowledged by the crowd. A friendly amendment was offered: we occupy the plaza not at the Gandhi statue, but a block down, where the presence of a Wells Fargo would serve as the symbol of the economic injustice at the heart of the protest. A concern was expressed that accusations of identity theft could arise if we were too close to the bank, while another compañera reminded us that all we have to do is point our backs to the bank cameras to let them know that we're not there for that purpose. It was noted that choosing an encampment site was little more than establishing a base of operations, and did not preclude the possibility of action at the courthouse, or any other future target. The proposal was reformulated to include both the possibility of action at the courthouse as well as a campout on the mall, but nearer to the bank than the symbol of nonviolence. Prior to making a decision, a questioner asked how many people were actually willing to camp out. Approximately half of the now hundred-or-so raised their hopeful hands. With that encouragement, the crowd continued, ultimately reaching consensus on the proposal. The meeting continued, but shortly, a woman pointed out that while we had chosen a location, we had not chosen a time to begin the occupation. A discussion ensued as to whether we should refer that decision to committee or decide it together then. The conciliatory proposal, citing the advice of our New York comrades to take our time, was to wait until the logistics committee had met to provide everything necessary for the occupation, and to choose the right time at a subsequent general assembly. The proposal was resoundingly approved. After some discussion and announcements, including that the Blood Orange Infoshop was also available for the needs of the movement, the meeting adjourned so committees could group up and formulate plans. I was unable to visit all the committees but the ones I did see in action seemed to be doing their best to use a consensus format, even if not all of them had prior experience in doing so. The Riverside movement has a website, www.occupyriverside.org, a facebook page, a twitter (https://twitter.com/#!/OccupyRiverside), and upcoming meetings. Minutes are up on google docs. The next general assembly will be held on Thursday (timed to coincide with the artwalk) at 7:PM in the aisle down the middle of the mall in Downtown Riverside, just in front of the outlet of the finance cartel Wells Fargo. Please check the indicated websites for pre-GA committee meetings and other related activities. Despite some issues with facilitation and accessibility to all communities, setbacks which are to be expected any time a new era dawns, the people were able to discuss and agree collectively during the general assembly, and then, during the committee meetings, find ways to contribute individually. 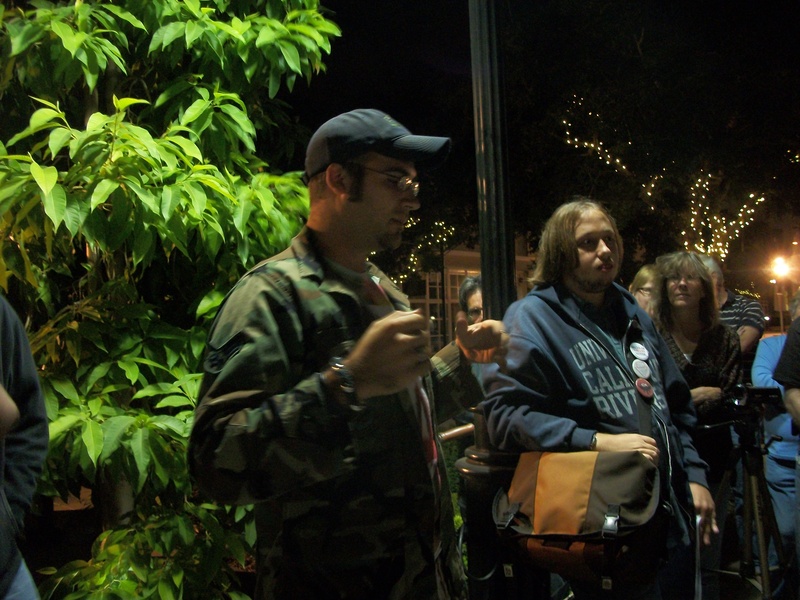 Like the Los Angeles occupation, the attendees constituted both seasoned activists both young and old, as well as a outburst of individuals heretofore unaffiliated with political action. The general spirit of the Occupy Wall Street movement, the spirit of love, hope, inspiration, solidarity, patience and redemption, was felt at this gathering, but was not as clearly articulated in words spoken or written as it had been in Los Angeles and seems to have been in New York. But that, like much else, is changing as we learn, and we have all exhibitied commitment to that learning.